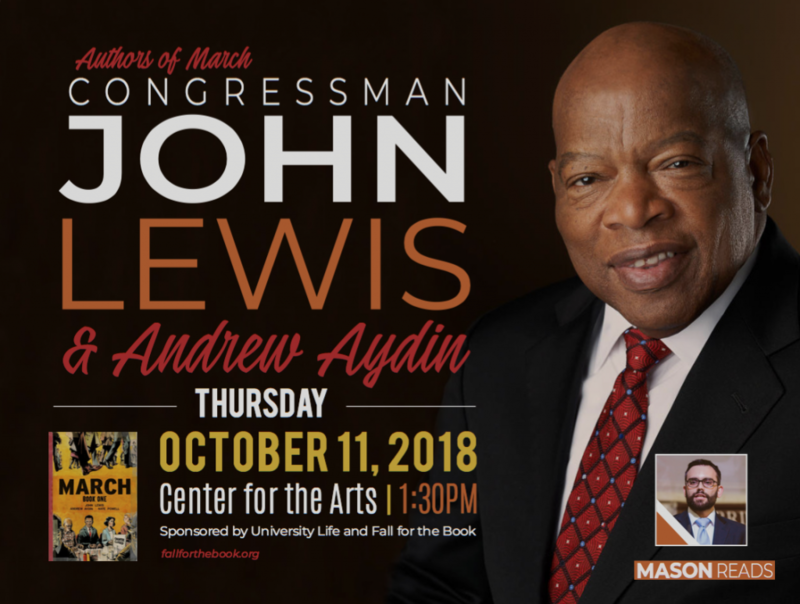 The 20th annual Fall for the Book Festival takes place at Mason this week (October 10-13) and Mason is thrilled to welcome Civil Rights icon and longtime Congressman John Lewis (D-GA) to campus to discuss March: Book One on Thursday, October 11, 2018 in the Center for the Arts. All Fall for the Book events are open and free to the public. March: Book One, this year’s selection for the Mason Reads program, is the first in the trilogy of graphic memoirs from Congressman John Lewis, written with Andrew Aydin and illustrated by Nate Powell. March follows Lewis’s remarkable journey in the Civil Rights Movement, from his youth in rural Alabama, to meeting Dr. Martin Luther King Jr., to the steps of City Hall. It is a testament of the power of nonviolent protest in the battle against segregation. Lewis and Aydin will speak about the books at this year’s Mason Reads event. Sponsored by University Life and Fall for the Book. Click here to learn more about the authors and the event.